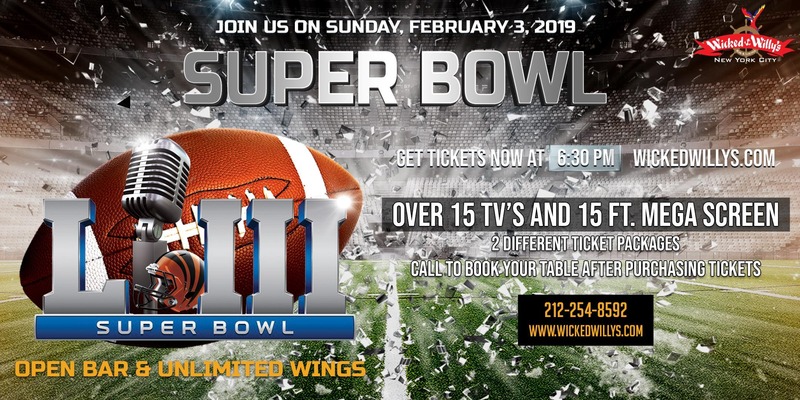 Caribbean oasis Wicked Willy's will be screening Superbowl LIII on 10 of its HD TV screens and a massive 20-foot projector with surround sound pumping your spirit up to high gear. Enjoy 3-hour premium open bar that includes endless well drinks, beers, wines, and select liquors for $59 per person. Even better, satisfy your cravings by including unlimited hot wings (which might not be just limited to wings - watch out for some surprises!) on top of that open bar by grabbing the $69 deal. Also find the $29 Rose Can Buckets for the classy chick in you. The night doesn't end there; ride that high and belt your winning tunes on the Karaoke available right after the game. After purchasing your tickets, please contact us at 212 254-8592 to guarantee your party's seating. All deals include guaranteed seating, except for the Rose Buckets.